← Fish in the sink. Thirty years ago I first set eyes on this mountain. That was a Youth Hosteling trip with my brother on cheap, unreliable bikes. The day we arrived was warm sunshine and we both got sunburnt. The second day it rained heavily and a landslide closed the main road. We were, therefore stuck here a few days. 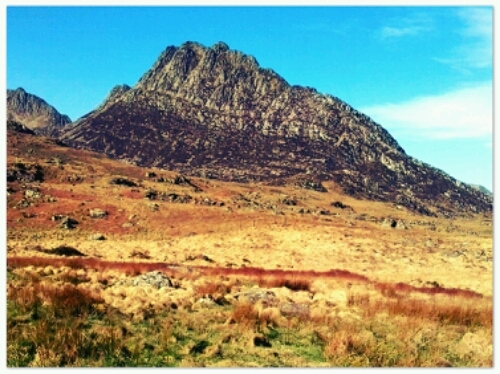 In all of this, Tryfan stuck in my mind. It looked ominous those days. It looks like a clenched fist on the valley side. Today, I climbed it. I took the Heather Terrace route on the east face. Conditions were perfect but it was three hours climbing. The title- bimble is a new word to me. They use it here to mean an easy walk, like amble, stroll, plod and all the rest. Clearly, there is a need for a word with a comedy tone. This entry was posted in No category and tagged camping, hiking, mountain, Tryfan. Bookmark the permalink.